This is an interesting use of the iPod: scouting opposing baseball teams. 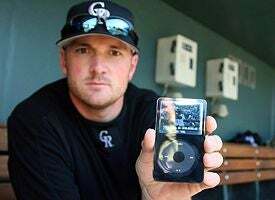 Instead of having to watch game tapes on a TV in the locker room with the other sweaty guys, players can take their videos on the road and study them anytime—including right before gametime. This lets players familiarize themselves with their opponents on plane rides, on buses, in the can, or even in bars. Also, these iPods were handy come draft day, when scouts could watch draft picks from here and there, quickly making a decision on which player they wanted. Our guess is that they even take these onto the field to watch a little Spongebob—they're just as bored playing it as we are watching it. Just kidding. We love baseball. That's the one with the hoops, right?